There it is. My one-hand, handcuff for the next two days. Together with my surfboard sized credential a security guard will permit me passage onto the show floor of the 2015 North American International Auto Show. Permit me a tangent. 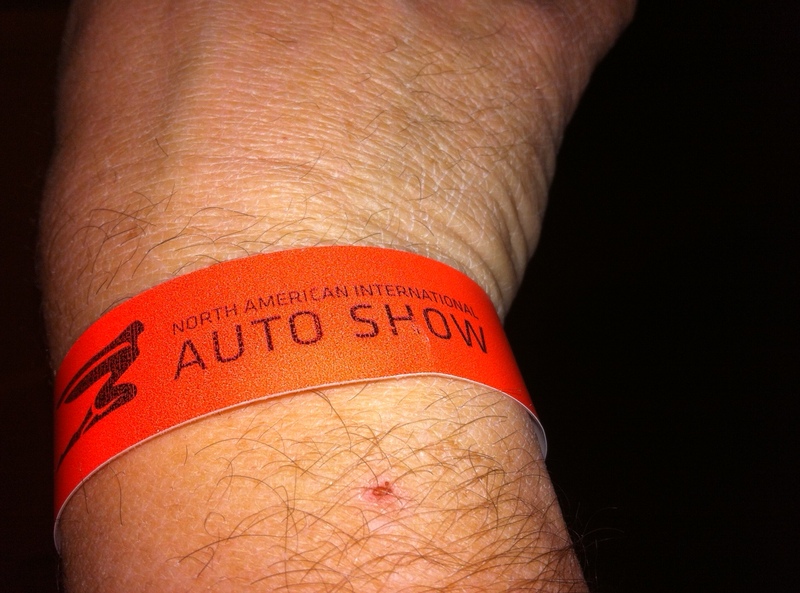 I pray endlessly for a slave to type “North American International Auto Show” for me. Thank you. avoiding a head-on collision with a journalist attempting to walk, take a selfie and shake a guy’s hand simultaneously, while accepting a breath mint. Thought it would be fun to take a few photos of our stand being set up and post them on the company Facebook page. After taking 8 shots I heard a sound getting closer that was either a mule-deer pursuing the love of his life…or a Cobo Hall security guard. Yes, they sound that much alike. Alas, it was a gentleman in blue waving his hands hollering, “no photos!” I smiled and explained I’m a PR guy from the company. “Well, no problem, then,” he said as he smiled and walked away. Then it dawned on me he never asked for ID or proof of my employment. I might have tried that at the Chevy stand but I try to be a wiseass maybe only two times a day. Since it was setup day there’s no free food around the floor, preventing me from grazing like a Costco shopper lunching off free samples. I decided to try the new food court. It looks a bit like smaller version of a food court in a mall, without the screaming kids or a Manchu Wok. The pizza looked good..deep dish..so I stepped up to the counter. “What?” asked the clerk. “Pepperoni,” I grunted back. The young lady gives me a look that says “no crap, that’s the only kind we have,” and just wiggles her index finger over the squares of grease apparently begging me to choose one. So I wiggled my finger back and she seemed to get the message. $9.32 later for one slice of index finger wiggle pizza and a bottle of Vernors, I sat down at one of the stylish Formica tables. First bite? The pizza was colder than Putin’s heart. Oh! Silly me! I didn’t realize they were selling FROZEN pizza! Ah! Well Monday and Tuesday the free food will be flowing, rendering the Food Court adjourned. More tomorrow.